A plane flying low due to high winds, sent roof tiles flying off a house in Birmingham, leaving a mum and neighbours feeling lucky to be alive. Sharon, 51, a shop assistant, said the incident occurred because planes were landing at Birmingham Airport. Sharon told the Birmingham mail, "It looks like a bomb site as 20 tiles came off and smashed in my garden and onto the furniture outside. I'm lucky, I wasn't sunbathing as I am usually outside if there's a spot of sunshine." Sharon tried calling the airport to inform them about the incident but they told her to ring back another day. An airport spokeswoman said, were 'looking in to the incident' after being informed by the Mail. 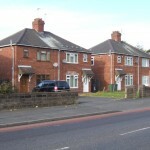 In 2009, the roofs of hundreds of homes in Kitts Green had to be re-tiled because the vortex winds produced by the planes flying to Birmingham Airport had caused the tiles to come away from the roof. A member of the airport's environment team said at the time: "Locating risk areas is very difficult. It can be the case that one side of the street has strikes and the other hasn't - it is very difficult to predict." If you need a conveyancing quote, our Preston solicitors offer a 'fixed fee' policy meaning you won't pay any legal fees if your purchase falls through. Contact our team today on 01772 88 2888 or email info@ellencourtlaw.co.uk.